Ive had my galah now almost 20 years. We moved house in Jan this year, and he's gone in to a large aviary like he was in around 2x2m 7ft high. But over last month or so I've noticed him going to corner of cage fanning tail with head down and almost laying down like he was nesting. He's never done this before. Has anyone got any thoughts? Let us know when you moved and how soon he started doing this. Moved in Jan this year. Started noticing it early last month. Has started mimicing some weird click noise not sure where he has picked that up from. Is the aviary located in a different place? Like, he was in the living room and now he is in a bedroom or he was indoor and now he is outdoor? Has he had a complete physical in the last 6 months? Do you even know if you have a male or a female? And he's always been outside. Is there another galah or any other kind of bird with him in the aviary? You don't have him all by himself with no company whatosever out there, do you? That would be really stressful to the poor bird... If this is the case, I would bring him inside where there is people - we might not be anywhere near as good company as another bird but, at least, it's better than nothing. I would also take him to the vet because males don't nest without a female so, if he is crouching like that, there is something wrong. Does he get a fresh food diet or do you free-feed protein food [seeds, nuts, pellets, etc]? He has always been outside in aviary. This house he is closer to back door and can see inside. No other birds in new house or last house. Only thing. Different here is the our 2 dogs are currently at another house. Only been in last month or so that I have noticed him doing this he's never done it before. He's still happy dancing and talking. He gets seeds an nuts. He wont touch those pellets, tried numerous times. Or eat fruit no matter what I give him. He's a strange bird. I moved at night thinking it would be better to keep the birds calm. Rainbow was confused. He sat in a window looking out for almost a year when I caught on. I had to give him more of what he knew and that was me. I kept him in the room I was in. I even set a place at the table for him so he could eat with me. (he is not just a bird he is my kid and I treat him the same as I did my kids.) I walked him around to look out all the window and tell him that what was out there was okay. When I did this he finally came out of it. I had a cage that a cockatiel came in that was 12X12X12 inches that he liked to sleep in. When I was going to do yard work I asked if he wanted to go and he would get in that cage. I would hang the cage on a hook under the shelter of my deck so the sun would not hit him. He watched me do my yard work like I did in NC. He still does not talk as much as he used too. 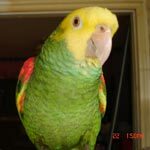 Well, I am afraid that if you have been free-feeding it seeds for 20 years and nothing else, you have a bird with liver malfunction as well as some serious avitaminosis... You do know that parrots are not natural seed eaters, right? They can't derive enough nutrition from them, they need fresh plant material - especially cockatoos which LOVE greens, fruits and veggies. Please take the bird to the vet and have complete bloodwork done on him as well as a full body Xray [which would show if his liver and heart are enlarged from the bad diet]. I reread one of your posts. You say the dogs are at a different house. Inter species friendship is somewhat common. Rainbow claims the terrier, Riddick, and will call him. Myrtle claims the Chihuahua, Jasmine, and my cat Squeekie. She will walk down the front of me to pet them when I do but she calls it a "tickle tickle". My cockatiel, Sweetie, used to go to the bottom of the flight cage to communicate with my cat, Fancy. These two were unusual even to me. Your bird may be missing the dogs or even the sounds that the dogs made.